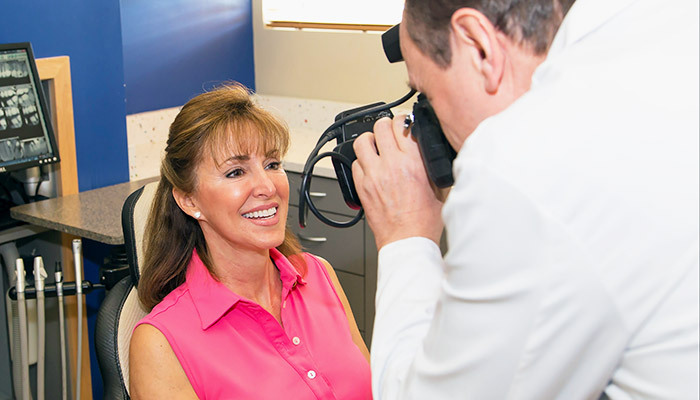 We take photos of your smile in order to plan out your smile makeover. We also use digital imaging software to show you what your new smile can look like. Dr. Radu believes that every person can have a perfect smile. The method of achieving it is as varied as each individual patient – and he’s helped hundreds. He’s highly trained in numerous techniques designed to give you a natural-looking, beautiful and functional smile. A member of the American Academy of Cosmetic Dentistry, he even teaches the subject to other dentists. Dr. Radu carefully listens to your questions and concerns and then chooses the techniques that fit your objectives. He draws from his 35 years of experience to help you achieve your smile goal – always going over alternatives – and doesn’t quit until you are happy with the result. Dr. Radu offers a free cosmetic consultation to go over your options for improving your smile. Once you’ve decided to move forward with your smile makeover, Dr. Radu takes you through a step-by-step procedure, answering all your questions along the way. Dr. Radu starts with a complete oral exam and takes photographs of your mouth. Dr. Radu works with you to create your beautiful new smile. Dr. Radu has many photos you can browse through to see how he’s helped others, and get an idea of what would work for you. He also manipulates the photos of your mouth to show you images of what your smile could look like. Next, impressions of your teeth are taken to create a study model with which we analyze how the desired cosmetic results match your bite, and if changes to the bite are needed. Any aesthetic change must be in harmony with your bite. Dr. Radu uses precision diagnostic instruments to ensure that your teeth will fit together properly when you bite down. A wax model is used to show you what your teeth will look like after your treatment is finished. The wax can easily be adjusted until it matches the look you want. Once it meets your satisfaction, it is used as the blueprint for your cosmetic treatment. We use a shade matching guide to get the shade of your new restoration just right. Dr. Radu uses a shade guide and digital photography enhanced in Photoshop to make sure your new restorations will blend in beautifully with your existing teeth. When needed, Dr. Radu will create beautiful temporary restorations such as veneers or crowns, so you look your best while your final restorations are being made in our lab. The temporary restorations play a critical role in the process. These are some benefits of the highly customized provisionals: the laboratory has a perfect model to follow, there is no guesswork about how the final restoration will look like; the function is embedded in the shape of the provisional, so minimal adjustment is needed when placing the final porcelain restorations; the patient has a lot of input, gets to see and approve the final result before it is done! Depending on your individual situation, Dr. Radu may employ any of the following tools in your cosmetic treatment plan. This can be accomplished with take-home whitening trays and in some cases can be done in the office. An economical alternative to veneers, dental bonding provides a strong, attractive tooth covering that looks natural. We do different types of high-quality veneers, determined person by person. Our crowns are made in our excellent lab from high-quality materials. Invisalign clear aligners provide a no-metal-braces solution to straighten teeth. We also offer Inman Aligner™when front teeth need straightening. A missing tooth can be unsightly as well as unhealthy. Dental implants most closely mimic a real tooth. Gentle laser treatment reshapes an uneven or poorly shaped gum line. When a filling is not enough and a crown is too much, tooth-colored restorations called inlays and onlays can be the perfect answer to repairing a tooth. These are non-metal fillings that look like part of your real tooth, and can make a huge difference in appearance as well as provide a healthier alternative to traditional metal fillings. To smooth out facial wrinkles and folds around the eyes, nose and mouth, Dr. Radu uses JuvédermXC and Botox Cosmetic gentle injections for instant results. JuvédermXC is a smooth gel filler infused with lidocaine for increased patient comfort. The natural-looking results can last up to a year. Botox cosmetic injections are done using a very fine needle to relax the muscle under a wrinkle, providing a softer appearance. These treatments are quick, easy, and you can return to your daily routine immediately afterwards. “My experience with Dr. Radu and his practice has been five-star. Dr. Radu listened carefully to every comment and concern I had along the way. He is patient and thorough, and his artistry is frankly amazing. Dr. Radu brought me through Invisalign to straighten my teeth and realign my bite, and we completed the improvements by replacing 20-year-old veneers that had yellowed as a result of the cement used at the time.